The HPI driver is implemented in layers. 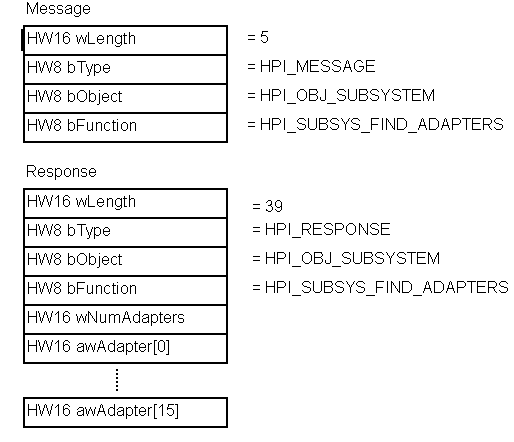 All HPI code is written in C. A HPI level driver consists of several modules/source files that constitute a layered interface to the adapter hardware. The driver communicates with the HPI using (input/output controls) IOCTL function calls. 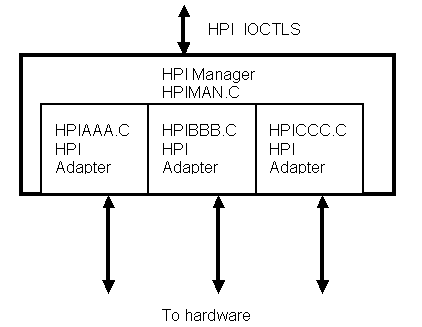 The HPI IOCTL is similar to the Win32 IOCTL - in fact an HPI IOCTL can easily be embedded in a Win32 IOCTL. The IOCTL consists of a message sent from the driver to the HPI, with a response sent back. The responses are synchronous i.e. the driver gets the response back at the time the IOCTL call is made. The following example shows the format of the SubSystem IOCTL message and response.